Protesters have gathered outside of California's GOP state convention on Friday afternoon where Donald Trump is delivering a keynote address. 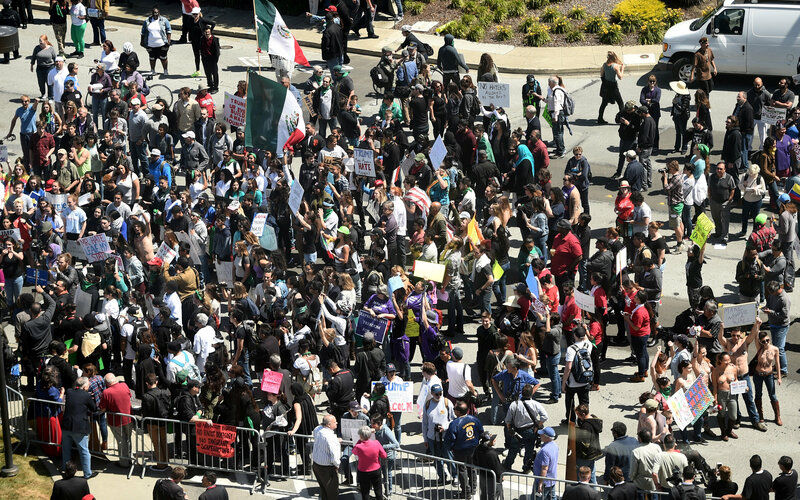 Aerial shots of the protests, which were largely anti-Trump, showed police officers holding a line blocking protesters as they demonstrated near the event taking place at the Hyatt Regency hotel in Burlingame, California, not far from San Francisco. Video of the crowds show what appears at this point to be a relatively peaceful demonstration, though there are pockets of slightly more aggressive protesters. CBS News campaign embed Sopan Deb is on the ground and spotted protesters throwing eggs at riot police and chanting near the hotel. Deb notes that protests happen outside all Trump events. Sopan did a live report from the ground. "No hate in our state!" was one of the chants heard outside the hotel. CBSN anchor Elaine Quijano spoke to one of the protesters who identified herself as a Democrat from San Francisco and said Trump "betrays" what's best in America. "If he was president, I think he would radically undermine everything that makes this country actually great," she said. When Trump started to speak, he joked, "I felt like I was crossing the border" after he said he climbed through and under a fence to enter the venue. Donald Trump hops a low barrier to avoid protesters at the entrance to the California GOP convention on April 29, 2016. Burlingame police said Friday that they were expecting 3,000 people outside the event, but preparing for 10,000 protesters, CBS News White House producer Arden Farhi said. Farhi said there appeared to be a variety of groups at the protest including supporters of Bernie Sanders and members of the Black Lives Matters movement. This comes just a day after protests erupted outside a large Trump rally Thursday night in Costa Mesa, California and just over a month before California's primary on June 7. Trump has shifted his focus to California where 172 GOP delegates will be up for grabs. The billionaire businessman remains the Republican frontrunner, leading with 977 delegates as Ted Cruz trails with 558 and John Kasich has 152, according to CBS News' latest count.